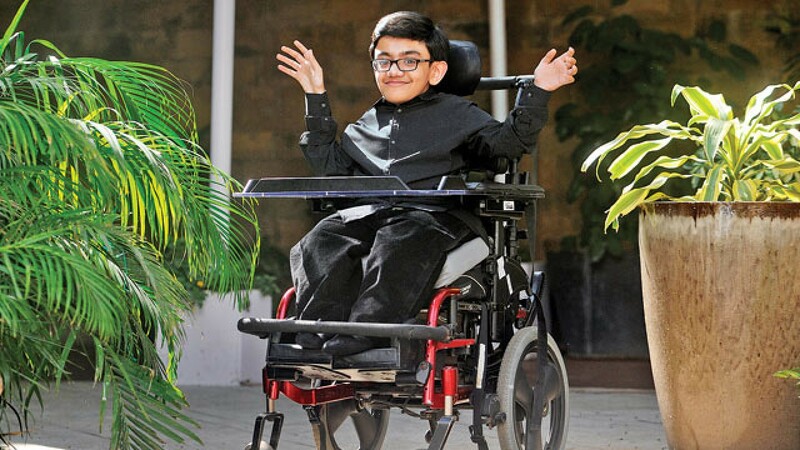 Sparsh (Stage Name: PURHYTHM) is a 15-year-old child prodigy who was born with an incurable disease called Osteogenesis Imperfecta, which makes his bones extremely fragile/brittle, due to which even a hard hand shake can break his bones. He cannot bear weight on his hands and legs; and hence cannot walk or run like other normal kids. He shares his personal journey with disability to empower .He said in a program , ‘I was born with 40 fractures . You name it, you broke it. I’m 15 years old, and I have Osteogenesis imperfecta, a rare incurable genetic disorder that makes my bones fragile, and hey, I know I can’t do things the same way as everyone else. I mean, my parents have to lift me in and out of bed every day, or when I go up the stairs at my friends’ houses. I just had to find what works for me and find how I can shine my light, what helps me cope. For me, that was none other music. Not only has sinning, songwriting and rapping helped me cope with my bad days, but it lets me share my feelings with everyone who might resonate with my story. In fact, when I started putting some of my covers up on YouTube, people from all over the world would send me messages that they were inspired by my music. We are feelers, We gave the world the adventures of Professor X and the music of Beethoven, Stevie Wonder, Kenny G, Ray Charles, Jacqueline Du Pre and Django Reinhardt. Out of every 20 human beings are disabled, so stop treating us differently. We never want anything more than love and acceptance though in the end, because we already have everything we need. You know, wheelchairs, Microsoft Sam, hearing aids, Google Glass, prosthetic limbs, Braille readers, robots, and of course courage . 15 years though and 130 fractures later, I’ve realized that my purpose is bigger than my pain, and my ambition is stronger than my adversity. Disabilities are not definitions. After finding that purpose, I now use my platform to inspire and encourage others to embrace who they are unleash their potential. I may have broken many bones, but I know that the two things that will never break in my life are my voice and my spirit. Sparsh became a worldwide internet sensation with the launch of Eminem’s cover song, “Not Afraid” with over 60 million views on all social media sites combined.